This summer we asked our summer interns to team up and create their very own podcast episodes. Over the course of ten weeks they needed to pitch a concept, draft a script, and record and edit their podcasts. We’re going to share those podcasts here with you on the blog over the course of the next few weeks! You can see all of their podcasts by clicking on the intern podcast tag. Education interns Erin Penn and Sara Philippe. 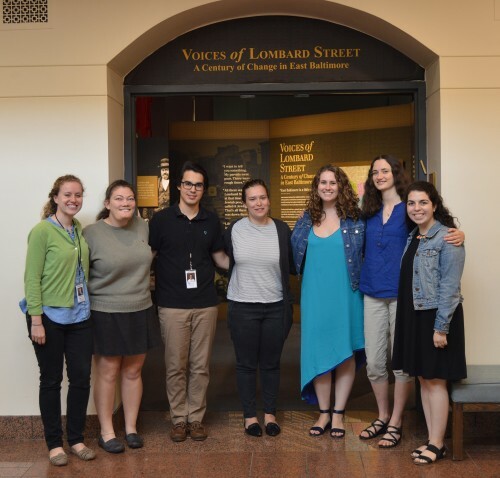 Summer education interns Erin Penn and Sara Philippe review their summer at the Jewish Museum of Maryland! Winners of fabulous prizes at Intern Night trivia! Campers hard at work on the Just Married! scavenger hunt. Listen to our “Henrietta Szold Favorites” playlist! Henrietta Szold’s Baltimore from 1860-1902: an izi.travel mobile tour! I’m so pleased to announce another successful summer of interns! 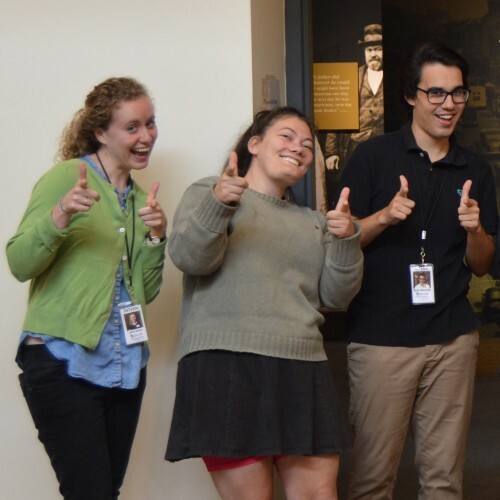 The Museum welcomed six new interns into our intense, ten-week internship program this year, and a seventh intern doing an extended internship through the summer and fall, spread across multiple Museum departments. 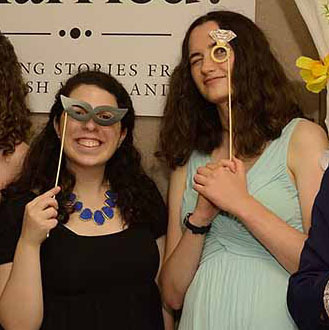 This year’s summer interns hailed from 3 different states (Maryland, Pennsylvania, and Ohio). All 7 interns came to us from different colleges and universities and between them they represented 9 different majors (four interns are double majoring!). Over the course of their internships they participated in a combined 2,450 hours of work and learning. 22 Blog Posts: Between their 2 individual blog posts and the weekly series “Intern Thoughts: A Weekly Response,” interns produced A LOT of words this summer! You can check out all the entries in the weekly response series HERE, and see all entries by (and about) our interns on the blog in the “intern” tag! The interns also created 5 podcast episodes, exploring topics ranging from collections care to Jewish identity in millennials – we’ll be sharing those over the next few weeks, so keep an eye (and an ear!) out. Once again staff donated their time and expertise to offer 6 professional workshops throughout the summer! We gave Esther’s Place a small face lift this summer in addition to our annual inventory and the interns’ assistance was invaluable, totaling 14+ hours of assistance, inventorying over 1,550 types of items! Working hard in Esther’s Place! 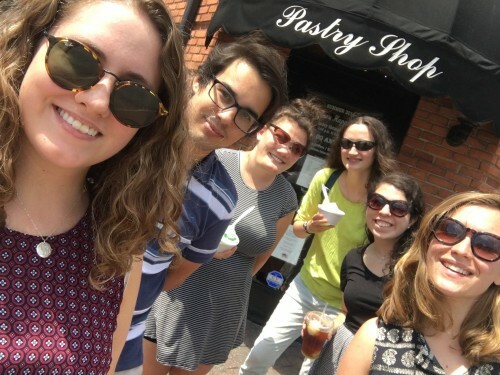 Interns were able to participate in 2 off-site fieldtrips over the course of the summer. 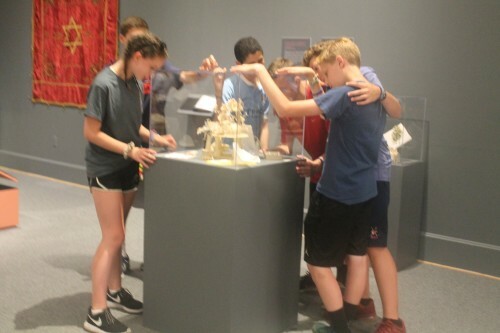 On Flag Day they enjoyed a 3 part visit to the Star-Spangled Banner Flag House & Museum – first observing the annual flag day ceremonies, then touring the historic Flag House and finally attending the afternoon lecture by K. A. Wisniewski on the story behind the design of the American flag. 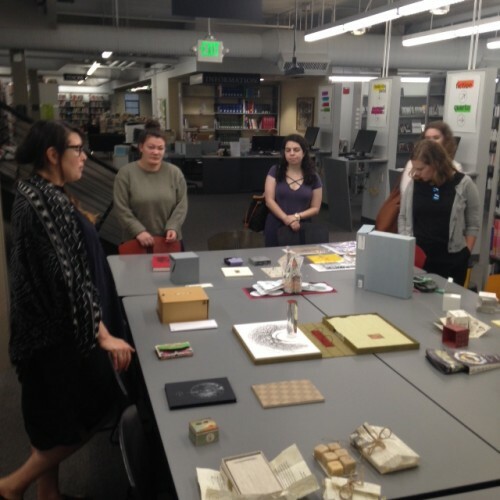 Interns also enjoyed a behind-the-scenes tour of MICA’s art library with library director Heather Slania, with a special look at the library’s “artist books” collection. Sara and Erin worked on several exciting and interesting projects over the course of this internship. From the start they hit the ground running, as they helped to put the final touches on the opening events for Just Married! Wedding Stories from Jewish Maryland. Also in conjunction with Just Married!, Sara and Erin created a scavenger hunt for the schools and camps which visited over the summer. They even got to lead the students through the exhibit. 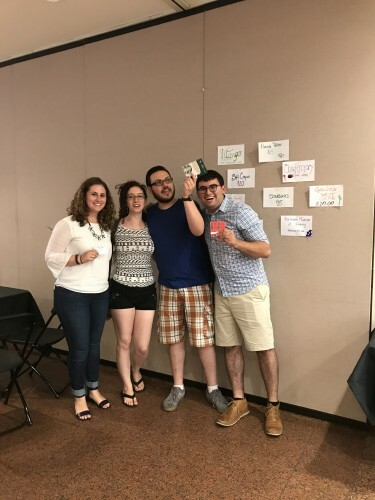 They researched and planned upcoming programs for the next exhibit, Discovery and Recovery: Preserving Iraqi Jewish Heritage, contacting artisans, caterers, and even planning fun craft projects. In connection with the new exhibit Sara and Erin helped to organize and create a companion curriculum for all types of students, young and old, Jewish and non-Jewish. Sara and Erin also joined in with Museum Educator Alex Malischostak and Education Director Ilene Dackman-Alon on their work for the Henrietta Szold bus tour, lending their voices to the audio recording. 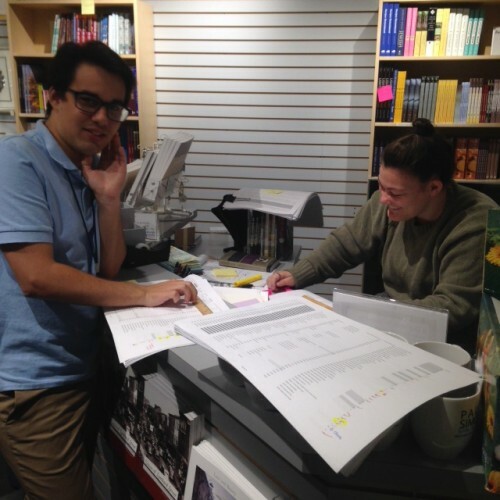 The pair of interns also helped with documenting damage at the Lloyd Street Synagogue, assisting in the planning and execution of a city-wide Intern Trivia Night, and organized the handouts and registrations for next week’s Summer Teachers Institute. Lastly, Sara and Erin researched and compiled a mini exhibit celebrating Talmudical Academy’s 100th year which will be displayed in the basement of Lloyd Street Synagogue (where the Academy began). This summer Joelle and Amy tackled a variety of projects as a team. They began with updating accession files, so that all of the information on our physical files appeared in our digital records. 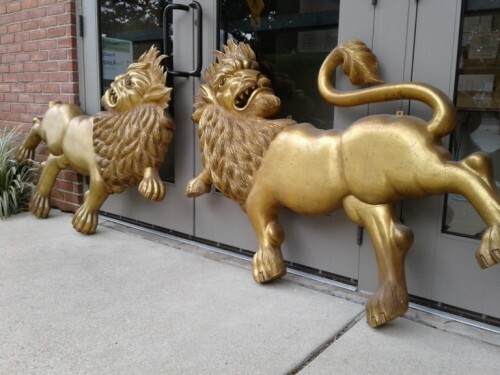 They continued a large inventory of the collections — photographing and measuring objects, and updating existing records. 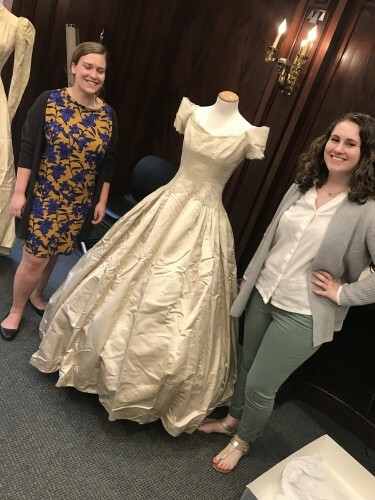 The imminent opening of Just Married: Wedding Stories from Jewish Maryland meant a break from condition reporting to help prepare the exhibit. Amy Swartz helped to steam all of the dresses for the exhibit and prepare them for display, including building pads and arms for mannequins to properly support and display the textiles. Posing with one of the many wedding dresses for Just Married! After Just Married opened, they turned their attention to a past exhibit, which is getting ready to travel. 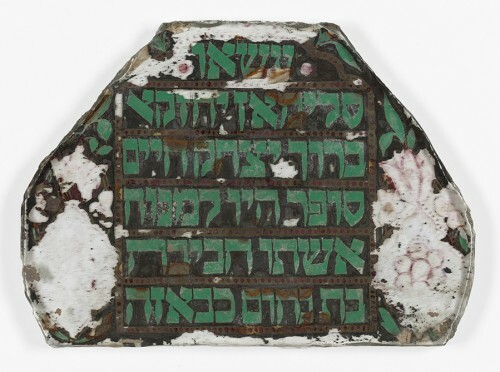 Beyond Chicken Soup: Jews and Medicine in America will open at the Maltz Museum of Jewish Heritage in Cleveland, Ohio this fall. Amy and Joelle gathered the objects from the exhibit, photographed and condition reported them, and packed them so that they would be ready to ship when the time comes. Ryan’s projects were all in relation to the “Belonging(s): What Connects Us” exhibit which opens in 2019. A long list of topics were given to Ryan and the other interns on subjects pertaining to “belongings” and were tasked with researching the topics and finding out how they can be used in the exhibit. Ryan focused on three topics: researching a character profile on a man named Dr. Samuel Neistadt, a Jewish socialist who immigrated to Maryland in his childhood and thrived in the Jewish institutions here; researched material in relation to the Maryland Jew Bill, particularly about a pilgrimage to the bill’s chief advocate’s grave; and finally, began extensive research and planning on converts to Judaism that may be included in the exhibit. Ryan even used his time abroad in Canada to do side work visiting the Jewish Museum in Montreal and writing for the JMM about it in a blog post. Ryan also donated the first siddur he ever bought during his own conversion to Judaism to aid in the research. Tirza worked as part of the Exhibitions team this summer. 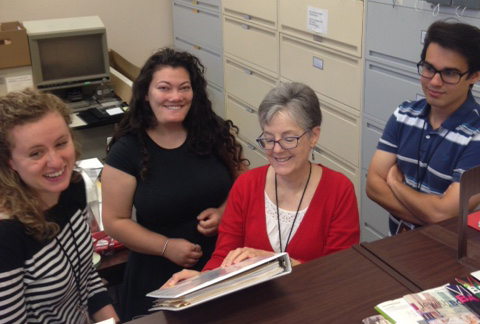 She was focused on an oral history collections project that the JMM is collaborating on with Beth Am congregation. The interviews are focused on the founding of Beth Am out of the Chizuk Amuno downtown congregation in 1974 and Beth Am’s growth through the years. 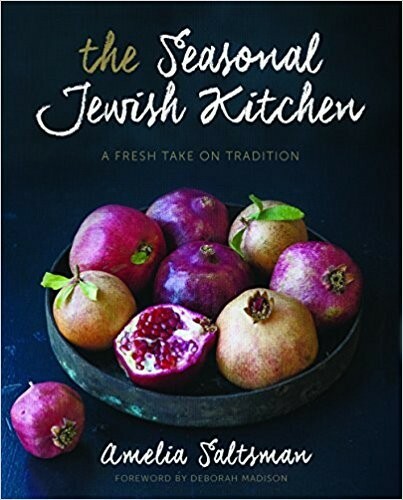 Tirza spent the first few weeks doing a lot of background research on the interview topic and working with Karen Falk, JMM curator, and Aaron Levin, the project head at Beth Am, to develop a set of interview questions that fit both Beth Am and the JMM’s goals. She then got in contact with potential interviewees and began conducting interviews in early July. She has also been transcribing, making archive entries, and doing all of the other tasks that go into collecting and maintaining oral histories for the JMM’s collection. Many thanks to all our interns. 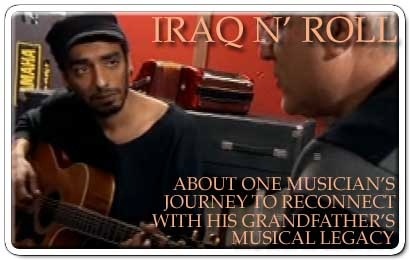 We hope they learned as much from us as we learned from them.